SYDNEY, AUSTRALIA--(Marketwire - October 16, 2010) - HotelsCombined.com, the world's leading hotel price comparison search engine, announced that the prices of hotels in Mecca (Makkah), Saudi Arabia, the birthplace of Islam, were up 31% for the Muslim holy month of Ramadan 2010 YOY. Sites statistics indicate the average night rate for Ramadan was USD $568 this year, up from $433 in 2009. Spokesperson, Hichame Assi, Head of Strategy and Online Marketing for HotelsCombined.com, said, "Whilst the average night rate for Ramadan increased, it did not cause pilgrims to cut their travels short, rather pilgrims extended their travels this year on average 7 nights, up from 5 nights in 2009. "As a global site we believe we are a good barometer to travel trends and based on site traffic, pilgrims and visitors from Europe, South Africa, America, Australia and neighboring GCC states were on the rise, while the number of pilgrims and visitors from developing countries, including Egypt, India, Pakistan and Philippines, dropped. We believe the drop is somewhat related to the rising hotel prices, although the drop from Pakistan may be due to the impact of the floods as well." 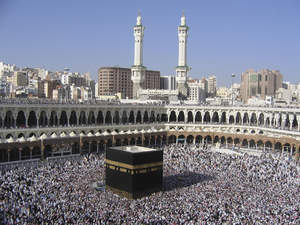 Early indications suggest hotel prices for Hajj 2010, the annual Muslim pilgrimage, will be triple that of Ramadan 2010 for independent travelers, signifying hoteliers are expecting record numbers of pilgrims to flock to the city on Saudi Arabia's Red Sea coast. "This year has shown travelers are making their hotel reservations earlier for Hajj in comparison to last year's bookings, which were largely last-minute bookings due to the H1N1 virus," added Hichame. HotelsCombined.com is the world's leading hotel price comparison search engine. The site streamlines more than 2,500,000 real-time international hotel deals into one simple and efficient format, aggregating prices from online travel agents and hotel chains, including Booking.com, Agoda.com, Expedia.com, Travelocity.com, Hotels.com, Hilton, Choice Hotels, Best Western and Intercontinental Hotel Group. More than 6.5 million monthly HotelsCombined.com users compare multiple hotels simultaneously and then click directly to partner Web sites to make a reservation. With no mark-up fees or additional booking fees, HotelsCombined.com offers travelers a completely free and invaluable tool for finding unbeatable hotel deals.